Each month a new and exciting specialty flavor chocolate covered pretzel is showcased. The Fretzel flavor of the month can only be purchased in the month it is offered and is available in half-dozen, one-dozen, and two-dozen boxes. Join the Fretzel of the Month Club to automatically receive the new flavor each month and take advantage of members-only discounts. Join now and receive a box of this month's specialty flavor Fretzel, and you'll receive following orders on the first full week of each month. Corporate Gift Memberships are perfect for making a lasting impression on your business associates. Please contact us for more information and to place orders. Sugary Sweet...an extra special treat. Cotton Candy flavored pink chocolate sprinkled with shimmery sweet sugar crystals. 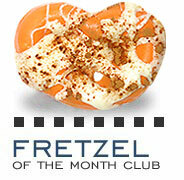 Check back each month to see the latest specialty flavor Fretzel! PLEASE NOTE: Prices are subject to monthly shipping charges.